I barely made it – this being the last day of the week. This week’s author is Patricia Briggs who is climbing my personal writer list. 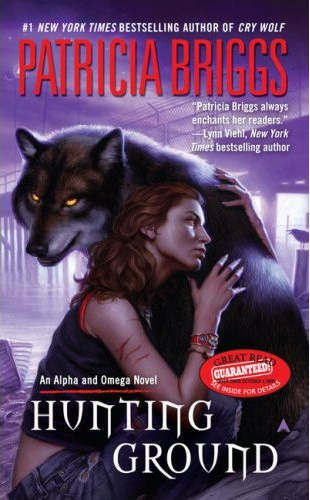 I’ve read this week the “Hunting ground” – her second book in the series Alpha and Omega. Those being the werevolves. It’s interesting, I’ve been reading books with werevolves for quite some time, and I never came across a reference to an omega werevolf (they are quite rare and do not display the aggresive behaviour of most of werevolves nor are they submissive, that being the solution to not being a strong enough wolf so everyone bows to what you say). The Alpha and Omega series just gets better with each book and I was sorry to read at Mrs. Briggs site that another book is not coming anytime soon, there are other books scheduled for release. The good news is that one of them is another of Mercy Thompson series – happening in the same world as the Alpha and Omega, mentioning some of the characters as well (like the Marrok – leader of all American werevolves and father to sons, one appearing as the Alpha in the A and O series, and another as a friend (used to be lover) of Mercy Thompson. One more good thing I realized browsing through Patricia Briggs’ site is that there are some fantasy books available (and I already saw some of the titles in my favourite bookstore – Algoritam). I’ll buy one of them to see if I’m going to like them (I somehow don’t doubt it) and let you know after how it went.